This article is a brief introduction about adding new functionality to a Flash webphone application in relation with Ozeki VoIP SIP SDK. After reading through this page you will be fully familiar with all the essential terms concerning Flash webphone functionalities and what you will need for creating your own solution using Ozeki VoIP SIP SDK. Flash is a multimedia displaying technology that can be used for creating webphone clients using the background support of Ozeki VoIP SIP SDK. A Flash webphone can be a click to call solution or a fully featured web page embedded softphone. This article shows you how you can extend your Flash webphone with a new functionality by using Ozeki VoIP SIP SDK. You will find it easy and understandable. Follow the guide below and you will be able to add any new functionalities to your webphone if you want. The client-side of a Flash solution can be extended with a new function very easily. You only need to define a new function in the Flash code and connect the code together with the server. 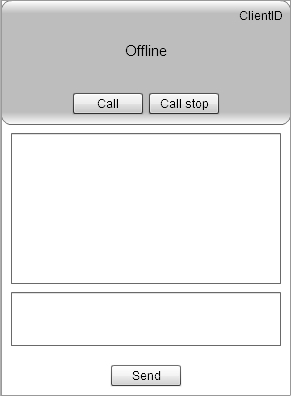 In the example program you can download from this page, you can see the functions for audio communication between two webphone clients. When you want to extend this program with a text messaging function, you need to add some GUI elements to the program. There will be two textboxes and a send button on the GUI (Figure 2). Put two textboxes on the GUI and name them txtChatLog and txtMsgInput. The txtMsgInput textbox will be used for typing in the text messages and the other one will show the message logs. The text message sending is a relatively special one as text messaging can be done without the server. In this case you need to place a Send button on the GUI and the event handler for that button needs to be similar to the one in Code 1. Extending the Flash webphone with text messaging is a simple task. If you want to extend the webphone with a functionality that needs server interaction, you need to use the instruction in Code 2. Please note that in the case of extending with a server supported function, the server-side method also need to be implemented. This article introduced you the basic knowledge about adding a new functionality to a Flash webphone solution and showed how Ozeki VoIP SIP SDK can help you to fulfill your wishes about this topic. If you have read through this page carefully, you already have all the knowledge you need to start on your own solution.